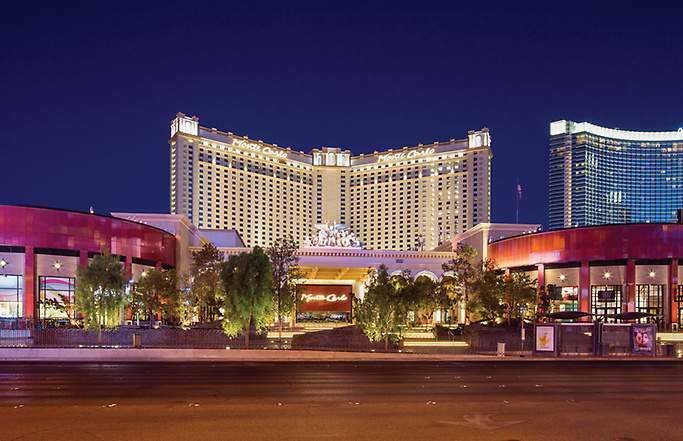 The Monte Carlo Hotel Las Vegas is situated perfectly in the middle of the Strip. The Monte Carlo hotel has 3,000 comfortable rooms and over 250 suites that are easy on your wallet. The Monte Carlo’s décor stands out not for its Mediterranean feel but for the elegance of chandeliers and fresh cut flowers in the hallways. There is also a small boutique hotel on the 32nd floor named HOTEL32, where for a little more money you can enjoy the VIP treatment. The casino has a men’s club feeling in décor with lots of neon too as well as a small race and sports book. There is a wave pool and even a lazy river in this five pool complex. Entertainment within the Monte Carlo includes the Minus5 Ice Bar. The dining options offer cuisine from many cultures and tastes from around the world as well as the Double Barrel Roadhouse. Overall, the Monte Carlo Hotel and Casino is the perfect mixture of location, elegance and price. 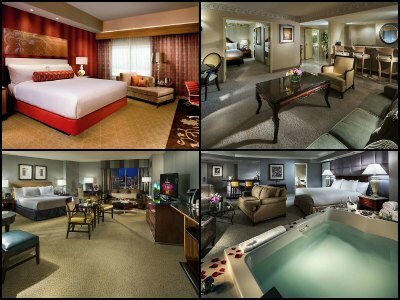 You have plenty of different rooms and suites to choose from at the Monte Carlo Hotel Las Vegas. The Deluxe Rooms are a bit bigger than industry normal at 400 square feet. The rooms are tastefully decorated with a small sitting area with chairs, comfortable beds and sufficient wardrobe space. There is also a medium sized bathroom that has a tub and shower combination. High Floor and Strip View rooms begin on the 23rd floor and are the same size with similar amenities as the Deluxe. The Spa Suite at the Monte Carlo has an in-suite spa and is 700 square feet in size. This open room layout includes a nice sitting area, plenty of wardrobe space and a wet bar with a sink. The bathroom is filled with Italian marble and offers a separate shower. The Monaco Suite has great views of the desert and is the same size as the Spa Suite. There is an open floor plan with an elegant sitting area, a large entertainment center and a wet bar with a sink. The master bathroom has Italian marble a large whirlpool tub with a shower and there is also a half bathroom off the living area. The Diamond Suites are 825 square feet and are located starting on the 16th floor. These suites offer a separate bedroom with a small sitting area, a large living room with a sofa sleeper, an entertainment area and a wet bar with a sink. There is a large whirl pool tub and shower in the master bathroom as well as a half bathroom located off the living area. The HOTEL32 is a boutique hotel that resides on the 32nd floor of the Monte Carlo towers. All the accommodations are upgraded with views of Sin City included and your own personal suite attendant that guarantees an outstanding VIP treatment during your stay. The Studios include a pre-stocked refrigerator, an oversized shower and a nice media area in this 400 square foot room. Suites at HOTEL32 range in size from 700 to 825 square feet and all of them are capable of connecting to a Studio for added sleeping arrangements. These suites are similar in floor plan as the suites in the Monte Carlo Hotel Las Vegas and each offers updated décor, a separate open floor living area, an entertainment area and a wet bar with a sink. These suites have oversized showers, dual sinks in the master bathroom, large whirlpool tubs and some suites may have an additional half bathroom. The views of the desert and the Strip as well as having a personal suite attendant make HOTEL32 one-of-a-kind in Las Vegas. There are no discos and nightclubs at the Monte Carlo Hotel Las Vegas complex but there are several interesting bars and lounges that will keep your entertained. The most interesting might be the Minus5 which is made entirely of Canadian ice and has a multitude of different vodkas. Others include the lounge area at the Brand which is a quiet people watching place; Andre’s is great for that after dinner port or cognac; the sleek and trendy Ignite Lounge offers classic cocktails; the Hit is perfect for watching high limit games; the wine bar at D.Vino’s is intimate with a wide variety of wine by the glass; the Dragon Noodle has a Polynesian feeling; the Big Chill makes signature frozen cocktails and the Pub has over 300 different beers. There is also live music on the weekends at Pub and the Double Barrel Roadhouse as well as a DJ on the rooftop of Diablo’s Cantina. 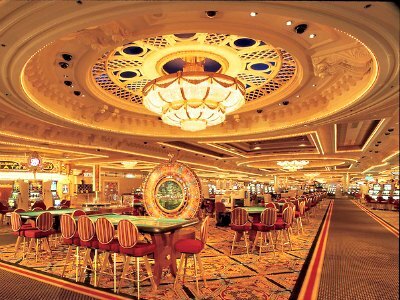 The casino area at The Monte Carlo Hotel Las Vegas is an exhilarating 90,000 square feet of action. Games include such favorites as Caribbean Stud Poker, craps and baccarat. There is also a separate poker room which runs four different tournaments daily as well as continuous games of Omaha, Limit and No Limit Hold ’Em and Texas Hold ’Em. 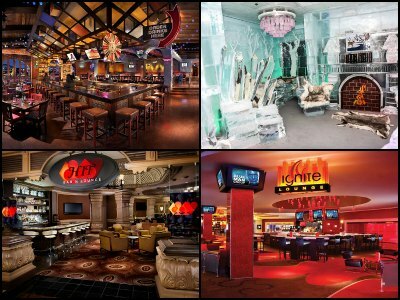 The property also boasts over 2,200 slot machines and video poker games. The Score at Monte Carlo is an upscale race and sports book with plush seating and large screen televisions playing all the important games as well as other sporting events. 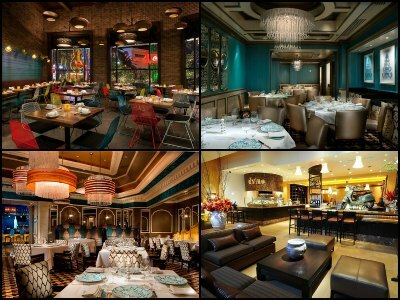 Dining at the Monte Carlo Hotel Las Vegas features many styles of cuisine and many different price points. On the food court side there is your usual McDonald’s, Sbarro’s, Subway and Manchu Wok as well as others. Other dining options include the Pub for casual fare and large screen televisions; 800 Degrees has classic Italian pizza; Dragon Noodle prepares fresh Chinese as well as sushi delicacies; D. Vino boasts expertly fashioned Italian cuisine paired with wine; upscale dining at the Sambalatte features fusion style dishes; the Japanese street style cuisine at Yusho is all about Yakatori; the Brand Steakhouse is the best place for meat eaters and Andre’s Restaurant specializes in superb French cooking prepared by Chef Andre Rochat. There is also the BLVD Plaza under construction but the two flag ship restaurants to this new area are open. Diablo’s Cantina boasts the newest and freshest Mexican cuisine concepts and the raucous Double Barrel Roadhouse has plenty of modern America dishes. The Buffet at the Monte Carlo Hotel Las Vegas has a unique flare to its décor and its cuisine. The state-of-the-art cooking stations ensure freshness and many different cook to order items. 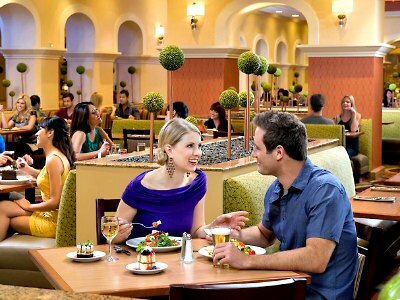 Stations include a variety of cuisine from around the world as well as standard buffet favorites such as a pleasant salad making area, a pasta bar, and a carving station. The grilling station and dessert bar are made for indulging in great food. The buffet changes over from breakfast, lunch and dinner on a daily basis. The weekend boasts a nice brunch and dinner specials range from steak night to seafood night. If you are looking for a no-hassle day of eating then try all-day pass that is offered. The Monte Carlo Hotel Las Vegas has a great selection of water complexes ranging from an intimate pool to a wave pool to a large socializing pool. There is even a Lazy River to float down. The four pool complex is distinct with Mediterranean décor cabanas and daybeds arranged strategically around each differently shaped pool. The Lazy River is a 400-foot long tube floating extravaganza that will leave you mystified. There is also poolside dining and cocktail service to enhance your day in the sun or you can enjoy a drink at the Pub Patio, Bayside Bar or the Brain Freeze Bar. 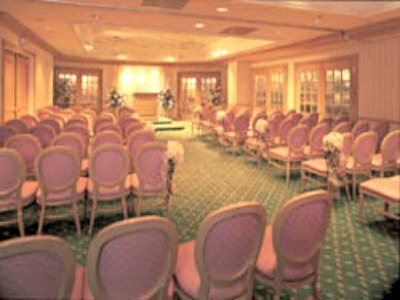 The Monte Carlo Hotel Las Vegas has specialized in provided prefect wedding day celebrations for years. Your expert wedding planner can help you plan your special day with a variety of options that fits your lifestyle. The Monte Carlo can provide you an intimate space or large space that is decorated to perfection with catering services prepared by the trained chefs of Monte Carlo or perhaps from one of the onsite specialty restaurants for that perfect touch. 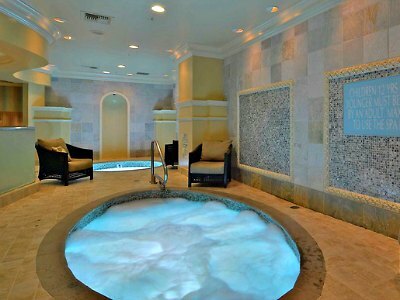 The Spa at the Monte Carlo Hotel Las Vegas is a 13,000 square foot area of tranquility and bliss. The spa has different areas for male and female patrons that include a plunge pool, steam rooms, saunas and hot tubs. There are five massage rooms for women and three rooms for men. The décor is peaceful and a day pass can be purchased to ensure you relax at all necessary times. The spa also features many unique Swedish style massages and treatments from hot stones to aromatherapy to a champagne and caviar facial. The Spa at Monte Carlo is an ideal place to relax at its finest while removing the stress from your body and soul. 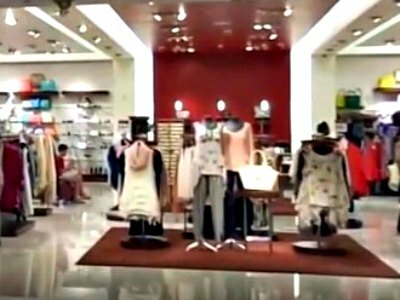 The Monte Carlo Hotel Las Vegas has a variety of shops that fit all of your shopping needs. Begin at the Street of Dreams which features outstanding retailers like Marshall Rousso and Misura for designer clothing as well as fabulous accessories; Harley Davidson of Las Vegas for that unique biker item; Optica has all the new fashions in eyewear for you to wear around the pool; Just Vegas has all of your souvenirs related to Sin City; the Lick will satisfy your sweet tooth at a new level; Casino Royale carries Vegas themed merchandise from the World Poker Tour; Monte Carlo Boutique features a variety of items from clothing to chocolate to romantic gifts; get that crazy t-shirt from Diablo’s and the Monte Carlo Nouveau News sells a variety of newspapers, magazines and other personal merchandise.